Magyari Szabolks, a Romanian vet, imported 10 top performance Essie Suffolk gimmers and a ram lamb to begin a Suffolk flock in Romania in 2014, having first visited the flock the previous December. They were in the top 1% of UK Recorded Suffolk sheep. The ram lamb was a son of home-bred Essie Gold Star and was a full brother of the top recorded ram lamb in the breed in 2013. Gold Star (top lamb in 2012) has sired lambs in Canada and Czech Republic. 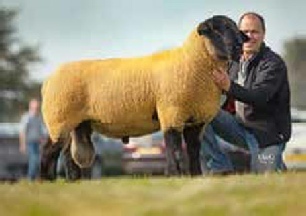 Patrick Haccou, a Suffolk Pedigree breeder from Holland, has bought Pedigree sheep from us over the past 8 years. Initially he bought 4 ewes and a ram. His most recent purchase was a shearling ram at Kelso Ram Sales 2014. Volker Derbisz, a Suffolk breeder from Germany, visited the farm in August 2015 with 3 colleagues. He farms around the city of Cologne. He bought 1 shearling ram and plans to return to Scotland in Summer 2016.